Video from the Archives, Memory & Identity symposium, held at UVA on 7 September 2018, is now available on the RBS YouTube channel. See the Archives, Memory & Identity page for more information about the symposium. Rare Book School is pleased to announce a free, public symposium jointly sponsored with the UVA Library, the McIntire Department of Art, and Virginia Humanities as part of Presswork, a project funded by The Jefferson Trust, an initiative of UVA’s Alumni Association. “Making & Teaching: Printing Technologies at Work” will be held at UVA on Monday, 25 March 2019. The first half of the symposium will feature a series of overlapping, hands-on demonstrations with specialized printing equipment, including a recently commissioned facsimile eighteenth-century French rolling press, as well as a hand-made facsimile type mold from the same period, built using schematic plans from Diderot’s Encyclopédie. Participants will have an opportunity to see these machines and tools demonstrated, as well as speak with the individuals who made them—and also try their own hand at printing. The second half of the symposium will feature a roundtable discussion exploring how hands-on teaching with facsimile machines and legacy equipment continues to influence cutting-edge scholarly research with books, prints, ephemera, and related documents. Guest speakers will explore issues including: how printing technologies shed light on textual instability; how bibliography’s traditional focus on letterpress printing has limited understandings of scientific illustration (primarily produced using intaglio techniques); and how traditional bibliographical methods for studying hand-press materials can be applied to twentieth-century media. The day will conclude with a keynote delivered by Amos Kennedy, who will speak on community printing, or the importance of bringing the craft of printing to broader publics. Mr. Kennedy will discuss insights and strategies for reaching out to community members through various venues, including public schools and libraries. Please see the event webpage for more information and full schedule. The Board thanked departing members John T. Casteen III, Joan M. Friedman, Jon A. Lindseth, and Mary C. Schlosser for their years of service. 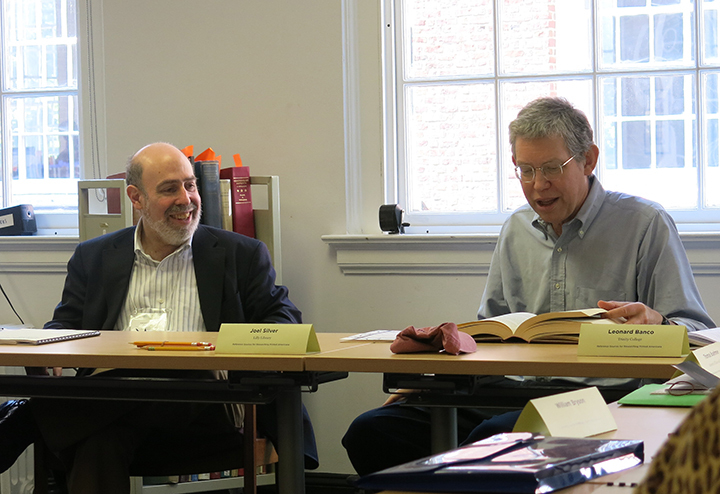 Rare Book School Founding Director Terry Belanger, having completed his term as a board member, has accepted the Board’s invitation to serve as a non-voting member emeritus of the Board of Directors. The Board also approved the addition of Alexia Hudson-Ward (Director of Libraries, Oberlin College & Observatory) to the Advisory Board of the Andrew W. Mellon Society of Fellows in Critical Bibliography. Rare Book School is pleased to announce the recipients of its Scholarship Committee awards, as well as the winners of the Buice Scholarships for returning RBS students, the second cohort of NEH-GBHI Scholarships, and the RBS-RBMS Diversity Fellowship. Congratulations! Applications for summer 2019 courses are now being accepted via our online application system, myRBS. Along with 24 courses in Charlottesville, RBS will also offer courses at the Lilly Library at Indiana University Bloomington; the Thomas J. Watson Library at The Metropolitan Museum of Art; the Grolier Club; Yale University; the University of Pennsylvania; the Free Library of Philadelphia; and the Harvard-Yenching Library at Harvard University. Please log in to your myRBS account or create a new account to begin the application process. Applications for Rare Book School courses are considered on a rolling basis until a course has reached enrollment capacity. To be considered for the first round of admissions decisions, submit your application(s) for summer courses by 18 February. See the Course Application page for more details. Facsimile format sheets and the workbook to accompany The Anatomy of a Book are still available through the RBS online store; copies of the DVDs will remain available until our current stock is depleted. The spring and summer 2019 Rare Book School course schedule is available! Along with 24 courses in Charlottesville, RBS will also offer courses at the Kislak Center for Special Collections, Rare Books and Manuscripts at the University of Pennsylvania; the Free Library of Philadelphia; the Lilly Library at Indiana University Bloomington; the Beinecke Rare Book & Manuscript Library at Yale University; the Grolier Club; the Thomas J. Watson Library at The Metropolitan Museum of Art; and the Harvard-Yenching Library at Harvard University. Applications for spring and summer 2019 courses will be accepted beginning in early January. Rare Book School is sponsoring a two-and-a-half-day seminar, “Digital Sustainability for Cultural Collections” at the MIT Libraries in Cambridge, MA on Wednesday–Friday, 12–14 December 2018. Nancy Y. McGovern (Director for Digital Preservation at MIT Libraries) and Kari R. Smith (Institute Archivist and Program Head for Digital Archives at the MIT Institute Archives and Special Collections) will lead the seminar sessions. This seminar has been designed to be of interest to curators and librarians of all kinds who are or may become responsible for the long-term management of digital content, but signup is open to anyone with an interest in the topics covered. The cost to attend is $500. As space is limited, signup for the seminar will be handled on a first-come, first-served basis. The registration deadline will be 28 November, but early registration is strongly encouraged. See the event page for more details and to sign up. We are now accepting applications for the 2018 Rare Book School scholarship and fellowship cycle. Applications are open for all RBS-awarded scholarships (for both first-time and returning RBS students), for the RBS-RBMS Diversity Fellowship Program, and for the Andrew W. Mellon Society of Fellows in Critical Bibliography. For general queries about scholarships or fellowships, see the FAQs page. Participation in the scholarship/fellowship program implies acceptance of the scholarship and fellowship Terms and Conditions. To begin the application process, please log into your myRBS account (or create a new myRBS account). On the Home screen, click the “Apply for a Scholarship or Fellowship” button on the left side of the page. If you have any trouble with myRBS, see the FAQs page or email rbs_scholarships@virginia.edu. The application deadline is Thursday, 1 November 2018 at 11:59 p.m. EDT. See the Scholarships page for descriptions of the various scholarships available, or the RBS-RBMS Diversity Fellowship Program page and the Andrew W. Mellon Society of Fellows in Critical Bibliography page for information about each fellowship. Applications are now being accepted via myRBS for six Rare Book School courses offered this fall and winter at the Morgan Library & Museum, the Library of Congress, and the University of Virginia. The Book of Hours, 1250–1550; taught by Roger S. Wieck. The Art & Science of Cartography, 200–1550; taught by John Hessler. Preservation Imaging: Science, Scholarship, and the Artifact; taught by Fenella France. Developing Collections: Donors, Libraries & Booksellers; taught by Tom Congalton, Johan Kugelberg, and Katherine Reagan. Provenance: Tracing Owners & Collections; taught by David Pearson. Physical Bibliography for Book Conservators*; taught by David Whitesell. Please log in to your myRBS account or create a new account to begin the application process. To be considered for the first round of admissions decisions for the October course, submit your application(s) by 4 September; to be considered in the first round of admissions decisions for the December and January courses, submit your application(s) by 15 October. Applications received after these dates will be considered on a rolling basis until each course has reached capacity. Our summer 2019 schedule will be available in October. * Please note that enrollment for course G-40, Physical Bibliography for Book Conservators, is currently limited to participants in the RBS-Mellon Library and Archives Conservation Education (LACE) Consortium Program. Rare Book School is sponsoring a two-day seminar, Exploring Ephemera, at the Winterthur Museum, Garden & Library and the University of Delaware on Monday and Tuesday 10–11 September 2018, preceded by a group dinner on Sunday, 9 September. This seminar has been designed to be of interest to curators, collectors, and librarians of all kinds who care for, research, and teach with ephemera collections, but signup is open to anyone with an interest in the topics covered. The cost to attend the seminar is $500. As space is limited, signup for the seminar will be handled on a first-come, first-served basis. We encourage “early bird” sign up before 1 August to improve your chances of getting a seat. We are thrilled to announce the lineup for this summer’s lecture series at the University of Virginia. The lectures are free and open to the public. All talks will take place at 5:30 p.m. in the Auditorium of the Albert and Shirley Small Special Collections Library (unless otherwise noted). Lectures will last 30–40 minutes with 10 minutes for Q&A, and will be followed by a reception in the RBS suite on the first floor of Alderman Library (Alderman 118). Tuesday, 12 June: Dot Porter, Curator, Digital Research Services, University of Pennsylvania Libraries: Is This Your Book? What Digitization Does to Manuscripts and What We Can Do About It. This lecture will begin at 6 p.m. in the Class of 1978 Pavilion, 6th Floor, Van Pelt-Dietrich Library Center, University of Pennsylvania. For information on past lectures, see www.rarebookschool.org/lectures. Past lectures are also available via iTunes or your preferred podcast delivery system (search for “Rare Book School”). Please note that course B-10, Introduction to the History of Bookbinding, offered 8–13 July at UVA, will be taught by Karen Limper-Herz, a new member of the RBS faculty. Karen is Lead Curator for Incunabula and Sixteenth Century Printed Books at the British Library. A student of Mirjam Foot and Jan Storm van Leeuwen, she has worked with and studied bookbindings from different countries and periods for nearly twenty years, and regularly publishes and speaks about bookbindings in the U.K. and abroad. She is the Honorary Secretary of the Bibliographical Society (U.K.) and regularly attends and speaks at the annual conferences organized by the Arbeitskreis für die Erfassung, Erschließung und Erhaltung historischer Bucheinbände (AEB) in Germany. We are pleased to announce the 2018–20 Junior Fellows in the Andrew W. Mellon Society of Fellows in Critical Bibliography, as well as the 2018–19 cohort of RBS-UVA Fellows. Many congratulations to all the Fellows; we much look forward to seeing you at RBS soon! Rare Book School, in partnership with UVA Special Collections, has received a grant from The Jefferson Trust, an initiative of the UVA Alumni Association, to fund “Presswork: A Program for Hands-on Historical Printing & Research.” This two-year, public-facing project draws on a spectrum of technologies and experiential learning techniques to foster student- and faculty-led printing and research at the University of Virginia. The program will publicize and augment UVA’s prominence as a leading research center for the history of printing, while training undergraduate and graduate students in the art of historical letterpress and intaglio printing techniques that they will then demonstrate to a variety of audiences, including UVA undergraduate and graduate courses, K–12 students, UVA alumni, and members of the Charlottesville community. Watch this space for further announcements about Presswork programming! RBS Executive Director Michael F. Suarez, S.J., recently delivered a TEDxCharlottesville talk, “Glorious Bookishness: Learning Anew in the Material World.” Click the link to watch the video, or go directly to YouTube. Rare Book School is pleased to announce the recipients of its Scholarship Committee awards, as well as the winners of the Buice Scholarships for returning RBS students, the first cohort of NEH-GBHI Scholarships, and the RBS-RBMS Diversity Fellowship. Congratulations! Applications for spring and summer 2018 courses are now being accepted via our online application system, myRBS. Along with 25 courses in Charlottesville, RBS will also offer courses at the Lilly Library at Indiana University Bloomington; the Thomas J. Watson Library at The Metropolitan Museum of Art; Amherst College; Yale University; the University of Pennsylvania; and the Free Library of Philadelphia. Applications for Rare Book School courses are considered on a rolling basis until a course has reached enrollment capacity. To be considered for the first round of admissions decisions, submit your application(s) for spring and summer courses by 19 February.